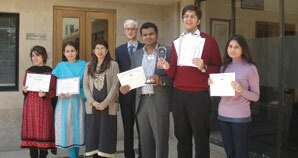 Pakistan College of Mooting Team for a consecutive 3rd time was declared the winners of the LUMS National Moot Court Competition 2012. The team members were Zeeshaan Zafar Hashmi, Muhammad Mustafa Khan and Maryam Mansur. The best Advocate award was also won by Zeeshaan Zafar Hashmi.